I’ve been searching for the perfect Caesar salad recipe for years. 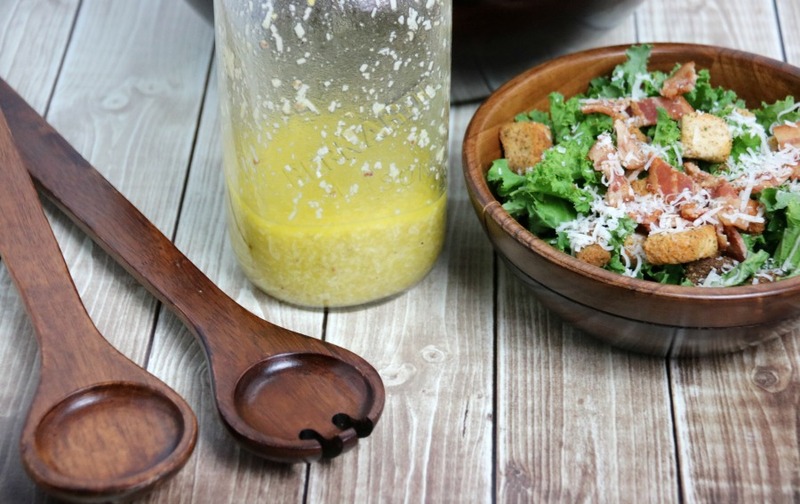 Growing up my Dad made the best caesar salad with a homemade vinaigrette that I just loved. However, once people decided a raw egg wasn’t ideal in caesar salad dressing we stopped having homemade caesar vinaigrette. I’ve tried countless store-bought dressings and tried a variety of caesar salads at restaurants, but nothing compared to the one I grew up with. Fast forward many years and my love for Kale caused me to create a Caesar salad dressing that went well with Kale. I experimented a few times until I settled on this combination and a vinegarette I believe rivals my Dad’s without an egg thereby making it a safer alternative to traditional Caesar vinaigrettes. The creaminess comes from a combination of Parmesan cheese, Dijon mustard, and freshly squeezed lemon juice. The result is a Caesar salad we love and make often. Fresh ingredients, delicious Kale and just the right amount of garlic create a Kale Caesar Salad recipe that will make you wish you made more each and every time. Delicious served alongside grilled pork tenderloin, steak or parmesan crusted chicken. Have a number of people coming for dinner? Make a double batch – it’s sure to be eaten up. *You will also need a mason jar or something with a lid you can shake the dressing to mix. 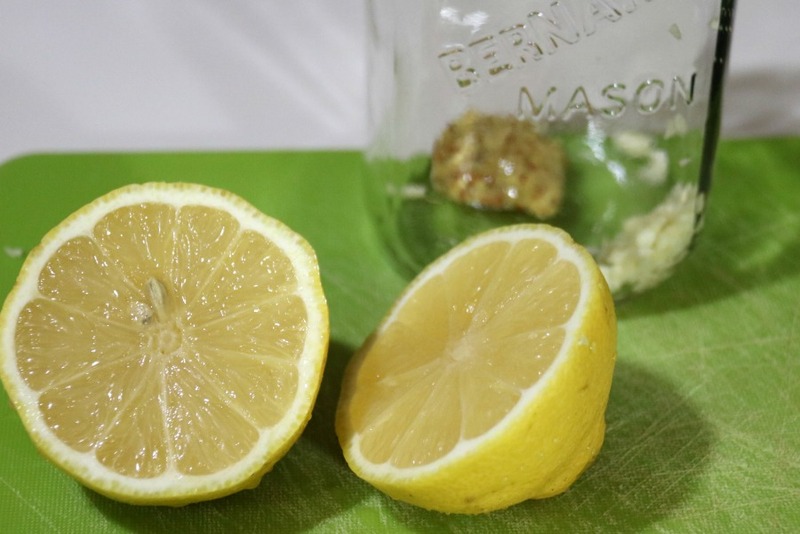 Add garlic, Dijon, lemon juice and salt to the mason jar. Add olive oil, Parmesan and pepper. Put the lid on and shake. Set aside. Wash, devein and chop Kale. Add to a salad spinner and spin until dry. Place in a large salad bowl. Top with croutons, bacon and Parmesan cheese. Pour dressing on and toss. *Kale and dressing can be made up to a few hours ahead of time and then add croutons, bacon, and parmesan prior to serving (great when hosting guests for dinner). A delicious creamy Caesar vinaigrette dressing made without raw egg tops this delicious Kale Caesar Salad. Perfect with any main dish or on its own. Put a lid on and shake. Set aside. I tell you, the salad is that good it fools the pickiest eaters into loving it! 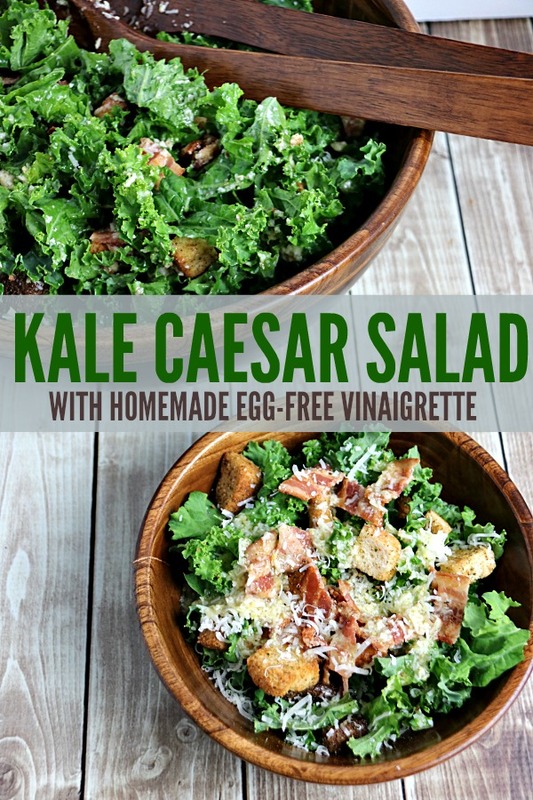 Whether you are a lover of all things Caesar salad or you are a kale purist this salad is definitely for you. Refreshing and garlicky all at the same time. It’s the perfect mix of fresh and new and traditional caesar salad. 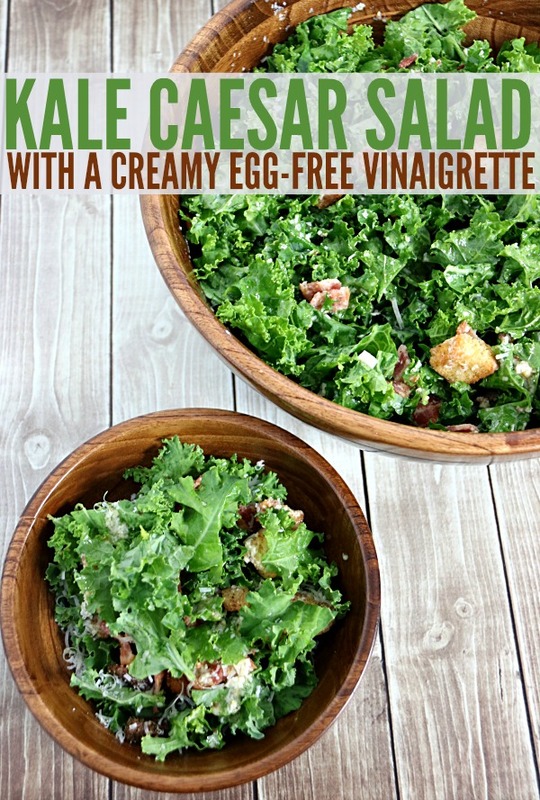 this looks delicious and i love the idea of using kale instead of lettuce. my kids would actually enjoy this! That looks so good! I love that you made it with kale instead of regular lettuce. Kale is so much healthier. It is so much healthier and truly delicious! We eat lots of salads in our house and this one sounds like a winner to me. Can’t wait to make some! I love Caesar salad! 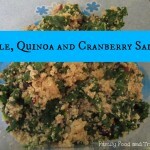 I have never tried it with kale but what a healthy way to get a little variety with your salad! I will have to try it! I am loving this!! Our youngest has a life-threatening allergy to eggs, so this is a new dressing option for him. I’m still not sure how I feel about kale, but I admit I haven’t given it as much of a try as I could. So, you have definitely inspired me to give it a chance. Looking forward to trying this dressing. Thanks! So glad this will work for your family. It’s super delicious! Can’t wait to hear what you think. That looks delicious. I’m glad to see it doesn’t have anchovies in it either. I’ve never made my own before but you make it look easy. I think Kale gets such a bad rap sometimes it seems. I personally like it for it’s health benefits. This is a great salad. I agree but it’s one of my favorites! Absolutely delicious. Yum, I love a good salad! I worked in a vegetarian restaurant all through college, and was spoiled with the best salads. Now I need all the flavors to encourage me to eat my greens. This kale caesar salad is certainly going to be a new fav. Oh we’re definitely going to have to make a this salad to go with pasta. 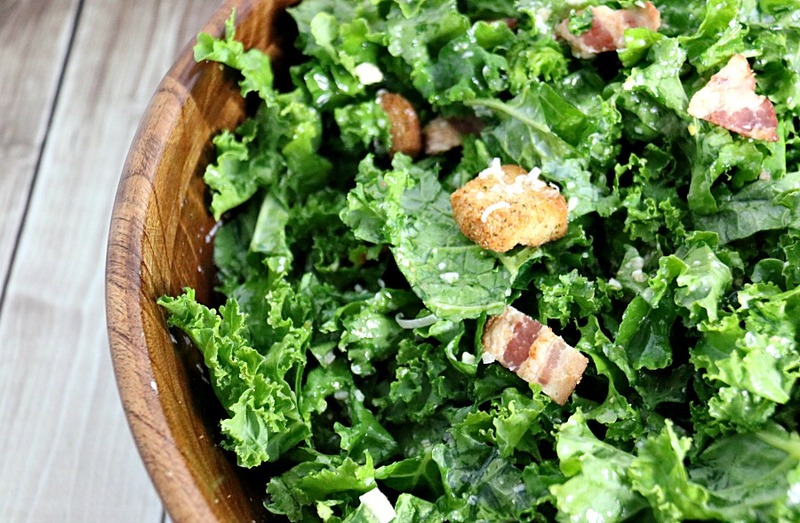 We love a good Caesar salad and the kale has so many additional benefits beyond being tasty! 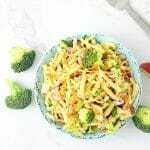 As a vegetarian and Vegan family this is definitely a recipe that will be on our dinner table ( minus the bacon- we will sub fakin bacon)! Thank you so much for sharing this- it also looks so tasty- I can’t wait to print out the recipe! This recipe couldn’t have come at a better time. I have been wondering what to replace romaine with in Caesar salad. Seriously, one of my all time favorite salads! I haven’t tried making my own dressing before though! I’m going to have to give it a try! I love salads in the winter! 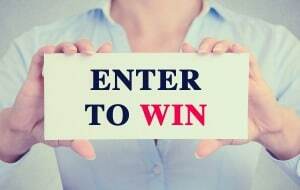 I can’t wait to try yours! I loooove Kale! I never thought of replacing romaine with kale. I have been craving a caesar salad. This sure does look delicious. This salad looks amazing. I love using kale because it holds up well to dressing. This is a great swap since romaine is no good right now! 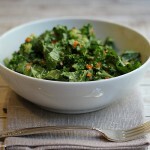 I love kale and am always looking for new ways to use it! I love Caesar. Perfect timing for this recipe since we can’t get romaine anywhere now. That is one yummy looking salad. 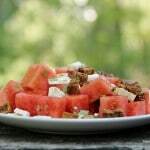 I love having a hearty salad for lunch or as a side dish at dinner. Can’t wait to try this one! I LOVE Caesar salads, and there is nothing in the dressing aisle that tastes nearly as good as restaurant quality. Now you are saying this is even better? Yip! Can’t wait to try, looks amazing! It truly is! Absolutely delicious.